After watching a video on someone doing a magnet implant in their finger I became very interested in Biohacking, specifically implants to give you more senses or abilities per say. I had a number of questions at first, some of which have been answered and some have not. If anyone could spare the time, answering these questions would help me understand biohacking in a much deeper way. 1. What is the usefulness of an RFID/NFC chip for everyday use? 2. What is the difference between the two (RFID/NFC)? 3. How noticeable are implants while they are healing (I want to be very discrete about implants and only want close friends to know)? 4. Do magnets affect working with electronics in any way (as in being damaging towards hard drives etc)? 5. What other common implants are there besides RFID/NFC and magnets? 6. What is the legality regarding implants? I greatly appreciate anyone answering these questions and thank you all in advance! access controll / unlocking stuff (doors, smartphones, external harddrives), some did subway tickets hacks, some did stuff like having a contact card stored on it. so it's mostly for fun. RFID is the technology as such. NFC is a one of many specific subsets of RFID tech. Depends on the size. Small glass capsule gives minor swelling and a 5-6mm-ish long cut, not all too noticable. Excuses are easy to find. Unless you work with vintage-HDD's , floppy disks, magnetic tape storage or tube-based screens no problem are to be expected. 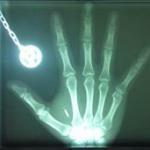 Magnets/RFID and cosmetic implants are the most common ones (besides medical stuff). There are a bunch of prototypes that do a bit more than that but you can't really call those common. highly depends on the country you live in. How noticeable are magnet implants while healing? And I live in the US if that helps with the legality at all. I got a magnet on the 14th of February. On the 20th of Feebruary I returned to work (Delicatess Department) I had no problems at work. My bodymod says also, don't play with it for 2 month. Healing was very good. For RFID: I can unlock my phone and log in into my computer. Share my vcard - use it as a trainticket (flying on holiday to Sweden soon) I have also a NFC password Safe on my phone to store my most important passwords. @Sandra thank you so much for answering my questions! I was wondering that if I’m living with someone and don’t want them to know would it be noticible for the first few days? From what I know most implants are mostly unnoticeable. They sit under the skin and aren't to big so I doubt they would be noticed. > @Sandra thank you so much for answering my questions! I was wondering that if I’m living with someone and don’t want them to know would it be noticible for the first few days? For the magnet, flexNT and the flexDF I had for several days a plaster. Fir the xEM, xBT and the X2 i had forv2 days a plaster. You can feel it, when you touch it.